A bit of preamble first … late in 2017 I started working with another developer on a WooCommerce fashion site. It used the Divi theme. It had been developed by another developer that was no longer working with the site owners (Annaoliva and Vanessa). The main issue was that the site was slow – slow for visitors and slow for admins. Over 6 months I worked hard to make the site faster and more stable without taking the site offline. I removed unnecessary plugins and wrote code to implement features in a future proof way (e.g. use WooCommerce actions instead of modifying template files). 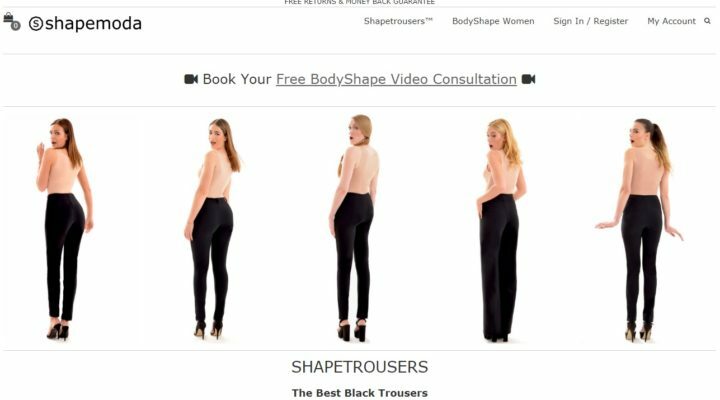 In late spring 2018 the site owners told me of their new business model (for Shapetrousers™) and new business name, shapemoda. They wanted a new site that would work well on mobile devices (which most of the existing clients used) – and be faster. Without the burden of the old site I was able to start from scratch. I am a big fan of the Genesis framework when building a website. It is lean and subsequently it is fast. This was my starting point. I only included plugins that were absolutely necessary. Annaoliva and Vanessa frequently showed me features of the luisaviaroma fashion site that they loved. I implemented some of the features on the shapemoda site e.g. changing the variations layout. The Shapetrousers™ products are custom made so take a little longer to receive. When one of the products is ordered the increased delivery time is mentioned in the order email via a note added to the email. The old site’s home page was very difficult to update. Annaoliva and Vanessa used to dread updating it. The Divi theme uses a visual editor; while this can make a site easy to update, it simply didn’t work as expected. This was likely due to one of the many active (but necessary) plugins. On the new site I decided to use Advanced Custom Fields Pro to make it super easy. I included helpful instructions with each section and enabled settings to prevent incorrect data being used e.g. limit image sizes. In February 2018 I spoke at a Dublin WordPress Meetup, delivering the Child Themes talk I gave at WordCamp Dublin. During the Panel Q&A someone asked about a recommendation for a web host. One of the suggestions was the Manchester based 34SP. I looked into their WordPress hosting and created an account. They copied the site to their servers and helped me with configuration questions. I have so far been impressed. Their support is helpful and responsive (I’d love if they had live chat like Blacknight, where this site is hosted) and their security is great – the wp-admin and wp-includes directories cannot be edited! Even better is that is that the shapemoda site works very well there.